It's quite easy to connect the Team eBay YouTube Video Stalker Dots. In this video we have Team eBay's Jason DeCanio screaming and hollering like a lunatic because someone allegedly didn't pay HubcapJoe for a hubcap. And at 11:02 he screams out "Put a Bullet in Your Heads!" Ovideo Florida Police Department has been notified and report filed. He hurls insult after insult then threatens my life with a firearm. Guess he was never taught to respect the elderly. I would think with friends like Jason who needs enemies! The digital dots so to speak are connecting from Jason Decanio, personal friends with Joseph DeMarco AKA CrazeeNyDriver on YouTube and an eBay Top Rated Plus Seller "HubcapJoes." Next we have Scott Henshaw who is a friend of Joseph DeMarco and has done at least one CrazeeNyDriver video show and added it to Demarco's CrazeeNyDriver YouTube Channel. Scott Henshaw is currently employed by eBay Inc as a digital storefront manager. New stalking YouTube channels are being added daily. 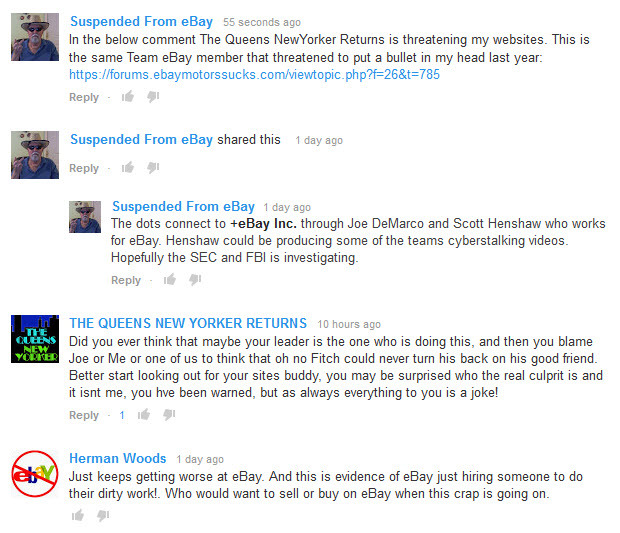 The $64 question is.. Is Scott Henshaw and his pals at eBay Inc the ones creating the YouTube cyberstalking channels to harass and intimidate eBay critics? Someone has been trying to SQL Inject this forum but the security in place did it's job. These guys think they are above the law. Must have something to do with "eBay will protect us attitude" eBay sanctioned or not. If the law comes down on them eBay will deny being involved. Better line up an attorney and bail bondsman, Jason DeCanio. Joe says the "authorities" told him NOT to engage ebiaj, but he got approval from the "west coast" to do so. Who, pray tell, on the West Coast could grant approval? You can embed YouTube videos by clicking the yt button and pasting the video id between the bb-code brackets. Paste only the video id "ZCPi3YMBCWU" not the full url. CrazeeNyDriver disabled video embedding. Sure sign of being guilty as mentioned above. Here is the link to it.